This week saw the release of an issue it appears a lot of people may have missed. In the “All-New, All-Different (Marvel) Point One” (the “Marvel” bit isn’t actually a part of the title, but with the logo so strategically placed, it’s hard to read it any other way), we get a sneak peek at various coming upcoming new titles framed within a single story. One of these stories features Daredevil, and is by the new Daredevil creative team of Charles Soule and Ron Garney. I read the entire super-sized issue and found it to be an entertaining enough read. The Daredevil story is really mostly devoted to his new sidekick Blindspot, which is quite alright by me since I’d been a little wary of the new addition. After reading this story, I feel a lot better about it. I like the premise of the character and how his power (more on that below) plays to Daredevil’s strengths. 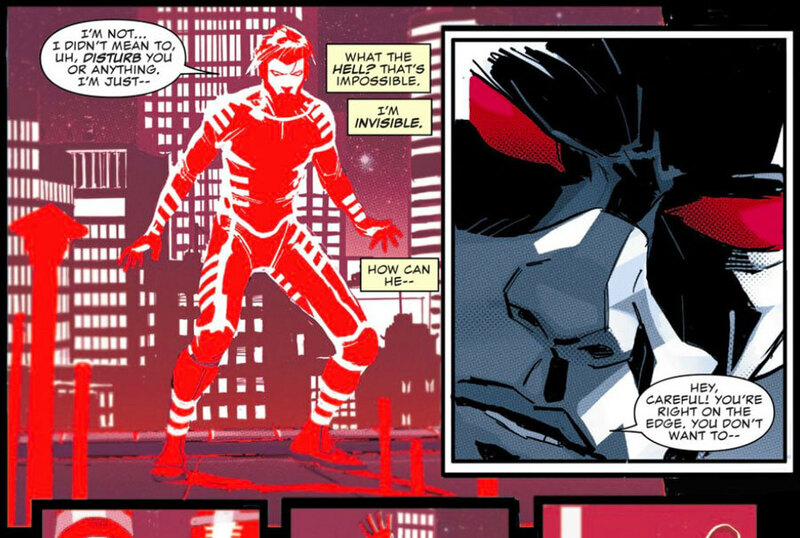 What this story doesn’t do, however, is give us much of an idea about how Soule intends to write Matt Murdock or what the larger world Daredevil finds himself in will look like. I think we may have to wait until December rolls around for that one. The idea of partnering Daredevil with a guy who uses some kind of optical technology to disguise himself is pretty clever, and the advantages of such a partnership are pretty obvious. Blindspot being a younger character with a flair for technology also reminds me of a young Peter Parker in some ways, and considering that Daredevil and Spider-Man have always had a pretty interesting relationship, this could be interesting. I also don’t expect this new character to be an ongoing, appears-in-every-issue-for-the-entire-run kind of presence, as that would make this new title a bit far off course for Daredevil. But time will tell! A few final comments about the art. Overall, I think it looks really good, and the brighter days of the last few years appear to be over. A big part of me will miss the old look, but at the same time, a moodier style is certainly not something any seasoned Daredevil fan will be unfamiliar with. I will admit to being a little disappointed with the radar perspective, as seen above. My opinion on this is that the artist should either forego drawing the radar altogether (a perfectly respectable choice, Gene Colan barely drew any “radar panels” at all), or make the effort to get as close to the imagined radar experience as possible. The way this is done tells us nothing about how Daredevil “sees” the world (since none of the background lights, shadows, or differences in color could possibly be something he would detect), and instead reinforces the notion that he somehow “sees” in a way that is similar to ordinary light vision. Garney is obviously not the first to make this kind of artistic choice. During the Bendis/Maleev run, radar shots were often accomplished by simply layering panels with a red filter, but after these last few years, I’ve come to expect something different. I’d love to see a new and different take on the radar, but not one that I feel misrepresents the character’s powers. So, did you guys read the issue? If so, what did you think? 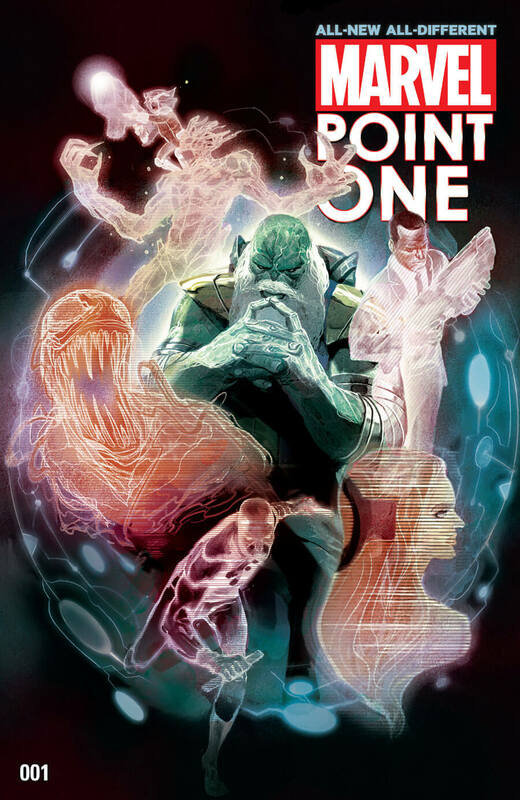 I will admit to being slightly nervous about this being as close to a real reboot as this title has ever seen, but am certainly curious to see what these guys come up with, and though Soule’s She-Hulk was great. Not sure about DD having a sidekick, although I enjoyed these few pages. Blindspot and his sister appear to be well developed as I was able to “see” each of their personalities shine through. I prefer DD stories that focus on Matt and his character and I worry the new additions will take the focus from that. I’ve enjoyed Soule’s writing before so I’m looking forward to see what he will bring to DD. Garney’s art is always excellent, and it appears to me he is trying a different style or slightly different with DD title. Maybe more of a frank miller look to it? Still solid look and the coloring definitely gives away what the tone will be in this book moving forward. A darker turn will be welcomed by me. It would be nice to see an artists contrast between matts world, almost cleaner and brighter, and DD’s world, darker, edgier, and more brutal , in the rendering. DD’s new threads have not grown on me yet. The bright red is almost too much and breaks up the costume in a bad way. When looking at the character I find my eye gets ” caught” on the red….sash? I think a black costume with red highlights would have been a better approach. Go dark or go home, right? I’m hoping there is an origin behind the new DD chest logo, which I’m also not to keen on yet. I really hope Soule really does a proper courtroom arc to highlight Murdock as a lawyer considering Soule himself is a practicing lawyer in NY (immigration law). The last good one we had was Bendis’ trial of the century… i could be wrong about this. Eight pages are few to understand. I like Sam Chung! Blindspot and his sister appear to be well developed. Garney’s art is fantastic. We have to let work Soule and Garney.